The Yuanwang 6 space tracking vessel left port on May 7 in preparation to support the launch of the Chang'e-4 moon relay satellite that is set for a lunar, far side landing. 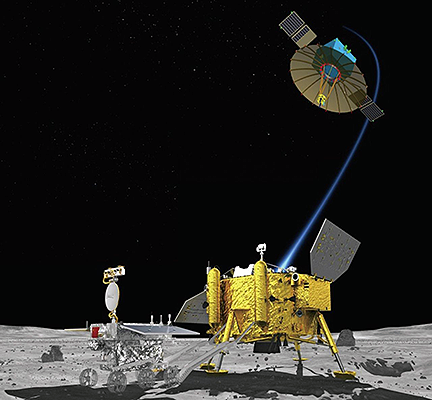 An artistic rendering of the Chang'e-4 relay satellite, lander and rover. Artistic rendition of China's Queqiao relay satellite for the Chang'e-4 mission. 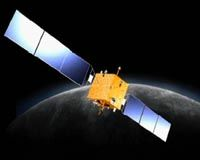 The Queqiao communications relay satellite is scheduled to launch from the Xichang Satellite Launch Centre on May 21, or later, via a Long March 4C rocket, heading for an orbit beyond the Moon. The relay satellite is a precursor to the Chang'e-4 lander and rover mission, which will attempt the first-ever soft-landing on the far side of the Moon in late 2018. China's Chang'e-4 relay satellite, which will launch next month to facilitate communications with a lander and rover on the lunar far side, was named Queqiao which means magpie bridge. As the far side of the Moon never faces the Earth, due to tidal locking, the relay satellite is required to be in place beyond the Moon to facilitate communications between terrestrial ground stations and the Chang'e-4 lander and rover. Its intended halo orbit around the second Earth-Moon Lagrange point more than 60,000 kilometres beyond the Moon will make it accessible to ground stations on Earth and the lander on the lunar far side at all times. 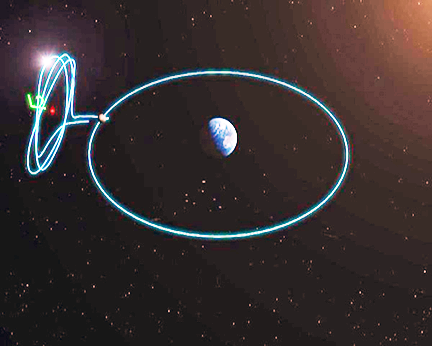 An artistic rendition picturing a halo orbit around the second Earth-Moon Lagrange point, from which the Chang'e-4 communications relay satellite will operate. Image is courtesy of NAOC/CAS. As well as its main communications role, the relay satellite will carry the Netherlands-China Low-Frequency Explorer (NCLE) for low-frequency radio astronomy experiments, and two smallsats, named Longjiang-1 and Longjiang-2, to test low frequency radio astronomy and space-based interferometry, as well as carry amateur radio experiments. Yuanwang 6 will track the spacecraft after launch from southwest China as the spacecraft heads into orbit, observing its trajectory and providing survey and control capabilities. Yuanwang space tracking ships, whose name means 'long view,' play a vital role in China's space tracking and data network, with systems aboard providing accurate information. A second ship, Yuanwang 7, is already sailing for an undisclosed location to support the launch after assisting with the launch of the Apstar-6C satellite from Xichang last Friday.